Alan Coleman translates his God-given skills from the dental office to those underserved countries through frequent mission trips. “I’m not here to make money. I’m here to develop relationships with people.” - Alan Coleman, D.D.S., F.A.G.D. Alan Coleman, D.D.S., F.A.G.D., has been struck by lightning, the victim of failed breaks on a riding mower, and the recipient of a concussion and broken ribs courtesy of a not-too-friendly horse. And that’s exactly what Coleman does. 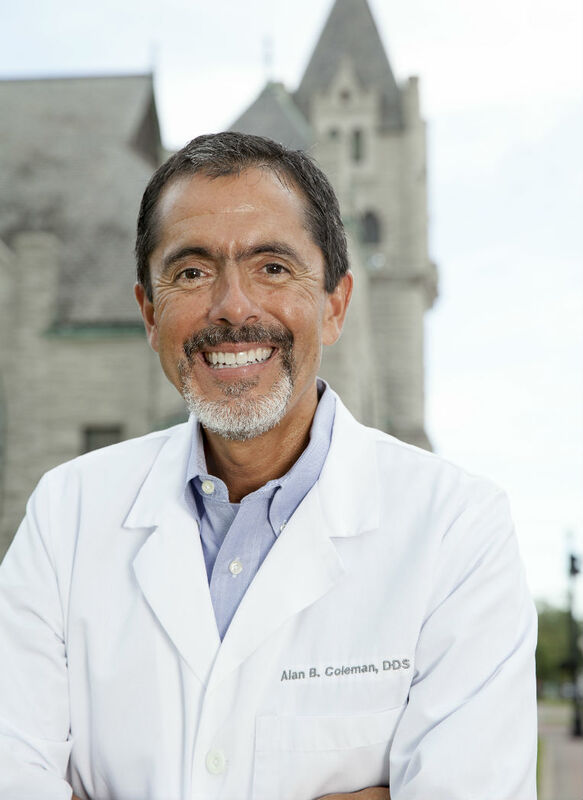 Alan Coleman is passionate about providing preventive care and alleviating pain for his patients. He says it’s his calling, something he was meant to do. And he shows his appreciation for his God-given skills through frequent missions to help those in underserved countries. Even as a youngster, Coleman was always good, and enjoyed working with, his hands. His grandfather was a master craftsman who carved roses out of wood, and he encouraged Coleman to build things in his shop. But the clincher on a career choice came when saw all of his friends whose fathers were surgeons never at home. That flexibility of schedule has allowed Coleman to coach his sons’ soccer and baseball teams, and serve for more than a decade on city council. He works three-and-one-half days each week, and uses the remaining time to be with family and give back to the community. He says it’s just the way he’s built. But Coleman has also done the unexpected, turning his garage into a playroom and building bleachers to accommodate weekly Young Life Club gatherings of some 60 participants. He says it is part of spreading the word to middle and high school children. “When they go off to college and then one day realize there’s more to life than partying, they’ll go back and seek the Lord again,” Coleman says. Most recently, Coleman has been busy building a barndominium on 20 acres up the road from his home. He describes it as a two-story, 48-by-48-foot structure that will include stalls for three horses, and an upstairs fashioning a lake house design where he and his wife of 35 years can one day retire. “We have a staircase and an elevator, so when I’m old and in my wheelchair, my wife can just put me in the elevator and get me upstairs,” Coleman explains. Though at the present time he’s far too active to retire. Coleman is the founder of Southeast Texas Hands for God Ministry, a 501(c)(3) non-profit corporation providing free dental care to the needy. For the past eight years, he and his wife have traveled to Haiti, Kenya, Honduras, Guatemala, and a Native American reservation in South Dakota helping those in need. He says he’s been to “some very cool places,” but has also had his share of hair-raising experiences. Traveling to impoverished countries has given Coleman an even greater appreciation for what he and his family have. Coleman recalls that most of the children and adults he has worked on in these countries say very little, if anything, when the work is done. But he loves telling the story of the time in Guatemala when, the day after caring for about 50 children in a tiny school, there was a knock on his door. Spirituality is extremely important to Coleman. He says he wouldn’t have the talent in his hands and head if God hadn’t given them to him. Which is why his ministry is called Hands for God. His lifestyle has changed a bit since Coleman married his wife Julie 35 years ago. They’ve come a long way from eating hamburger helper every night for dinner. In the end, Coleman says, it’s all about developing relationships. He has watched families and children grow up while going through his practice, and says those “kids” are all part of the family.